The Redwood Valley 5-Piece Patio Seating Set with Fire Pit by Hampton Bay offers the ultimate level of comfort and elegance. The fire pit keeps you warm and serves double duty as a table when you don't have a fire going. The flecked metal top surrounding the fire bowl adds a traditional flavor to the intimacy that a fire can bring to your gatherings. The fire screen, grate and poker are all included for your convenience. This eye-catching 5-piece set is perfect for smaller outdoor spaces in condo and apartment homes. Chairs feature richly woven frames, curved set-back arms and wide comfortable seating. Seat, back, and foot cushions all come in luxurious, fade-resistant Olefin fabric, which are as beautiful as they are durable. The glass top Side table has a captured Wicker rim to prevent breakage and provide greater safety. All pieces have a durable rust resistant, powder coated Brown frame. Entire set is packed in 1-box. Some assembly required. The Tyler 3pc chat set is made of durable steel and hand-woven resin wicker weave. The table features a removable tray table top and has foot levelers. The chairs have a woven back, olefin seat cushion and tropical accent lumbar pillow. This set is great for small spaces. The inherent beauty found in the Hampton Bay Woodbury 4-Piece Patio Seating Set with Textured Sand Cushions will create a cozy getaway right outside your home. The chairs feature richly woven frames, curved set-back arms and supportive cushioning for true countryside rest and relaxation. This set's included seat cushions come in soft, all-weather, textured sand polyester that is stain, mildew and fade resistant, while the faux wood rectangular coffee table offers a smooth tabletop surface that's perfect for drinks or snacks. 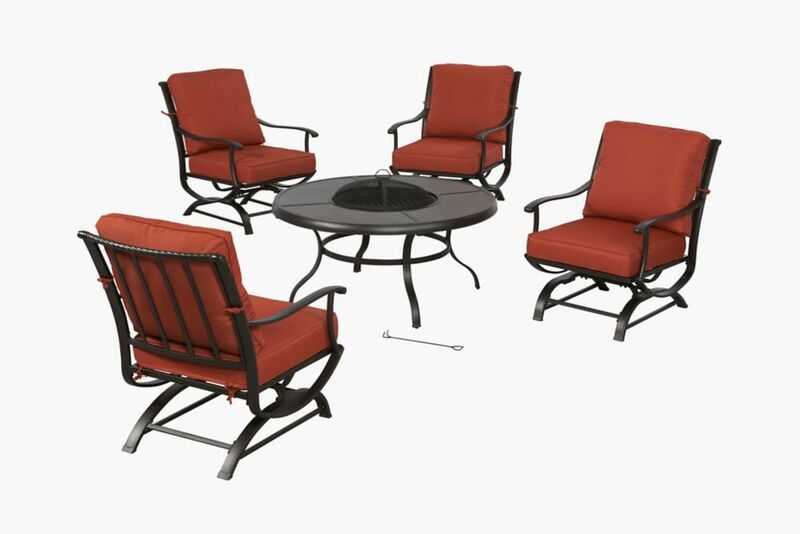 Redwood Valley 5-Piece Metal Outdoor Patio Fire Pit Seating Set with Quarry Red Cushions The Redwood Valley 5-Piece Patio Seating Set with Fire Pit by Hampton Bay offers the ultimate level of comfort and elegance. The fire pit keeps you warm and serves double duty as a table when you don't have a fire going. The flecked metal top surrounding the fire bowl adds a traditional flavor to the intimacy that a fire can bring to your gatherings. The fire screen, grate and poker are all included for your convenience. Redwood Valley 5-Piece Metal Outdoor Patio Fire Pit Seating Set with Quarry Red Cushions is rated 4.3 out of 5 by 574. Rated 5 out of 5 by Jan from Directions were very clear and we had it assembled within a couple of hours. Hadn't anticipated g... Directions were very clear and we had it assembled within a couple of hours. Hadn't anticipated getting it put together so quickly, so still needing to move out old furniture to make room! Rated 4 out of 5 by Lake from I would give this fire chat set 5 stars if it did not take a pair of vicegrips to get 2 of the ch... I would give this fire chat set 5 stars if it did not take a pair of vicegrips to get 2 of the chairs screw holes to line up correctly. The chairs are heavy duty. The table is adaptable, with a cover plate to go over fire pit, so it can be used as a table. Rated 5 out of 5 by Ralph from Beautiful set. Very easy to assemble. Well priced. Recommend this... Beautiful set. Very easy to assemble. Well priced. Recommend this item as well as the covers for the set. Rated 5 out of 5 by Mayflower from I’m very happy with the purchase. I love to hangout... I’m very happy with the purchase. I love to hangout with my family in the back deck every day. Rated 5 out of 5 by lonestarfiremedic from a must have Solid construction, very sturdy! We absolutely love it!! Rated 5 out of 5 by HomeDepotCustomer from Great quality and easy to assemble. ... Great quality and easy to assemble. Are the cushions weather (rain) resistant?? Do the chairs swivel or rock at all? Hello, Thank you for your inquiry. The chairs feature a rocking motion. If you have any further questions, please give us a call at (866) 602-1800. Are the cushions red or orange? Actually they are NOT red!! They are rust colored and you sure can't tell that by the photos, which is disappointing. Also, I read this review before I purchased, so I had faith in the manufacturer that they would know what color their product was! what is the maximum weight a chair can handle? The weight limit of the chair is 225 lbs. Hello, We suggest to use a UV/Water Proof Cover. What are the thickness of the Cushions and are they one piece of two? Can you order the chairs separately without the fire pit? Hello, Unfortunately, the chairs are not sold separately. If you have any further questions, please give us a call at (866) 602-1800. Are the cushions attached with a Velcro strap or a string that needs to be tied? The cushions are held in position with Velcro straps.